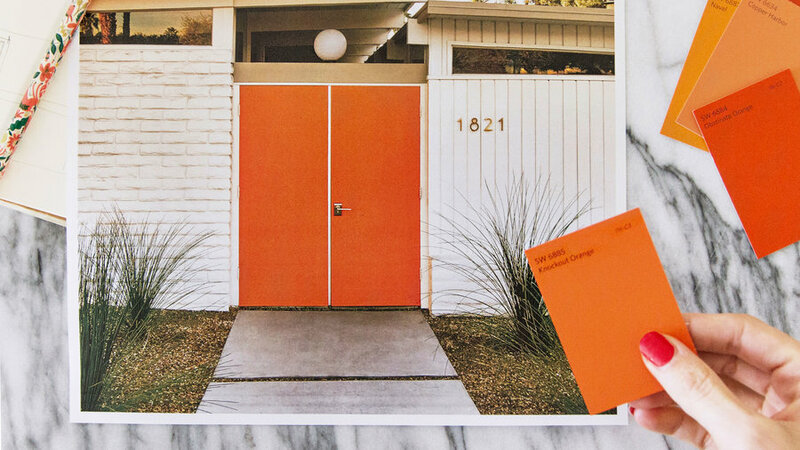 Classic midcentury modern lines—a flat, thin roof and low-slung angles--get an exclamation point from the bright orange door. This home further updated the house by painting both the brick and slender vertical paneling white, and adding large pavers from the front door to the street. Concrete steps lead the way to this Oakland, CA house on a hill—much more modern than the busy red bricks that used to be in their place. 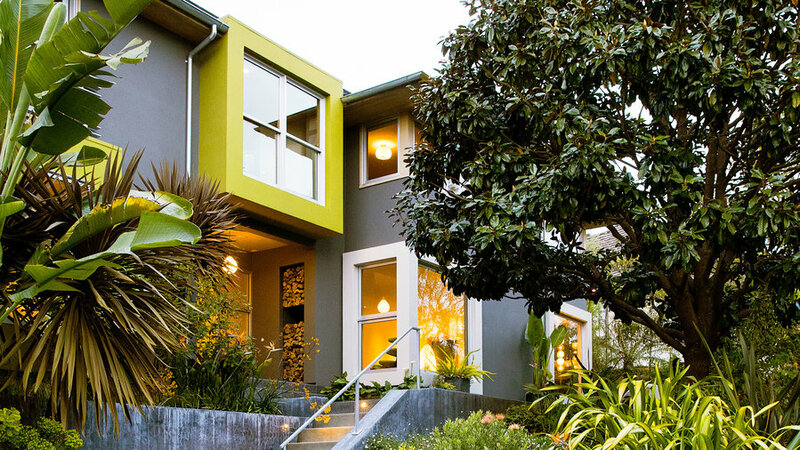 Charcoal-colored concrete retaining walls are the perfect neutral color to show off the chartreuse details, from window trim to plan life. Before a renovation, this bungalow had an aging stucco finish and an unfriendly chain-link fence. The architect maintained the modest exterior but made it more welcoming with a front-yard vegetable garden and a low horizontal fence. 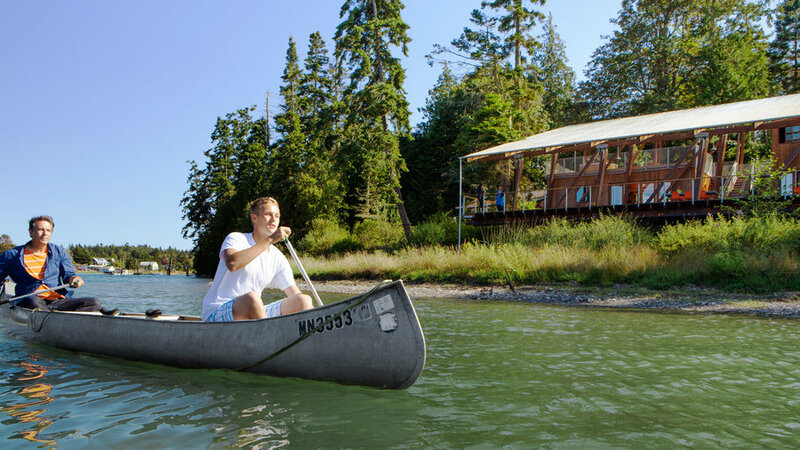 When your house sits on a body of water, “front” and “back” are hard to distinguish. 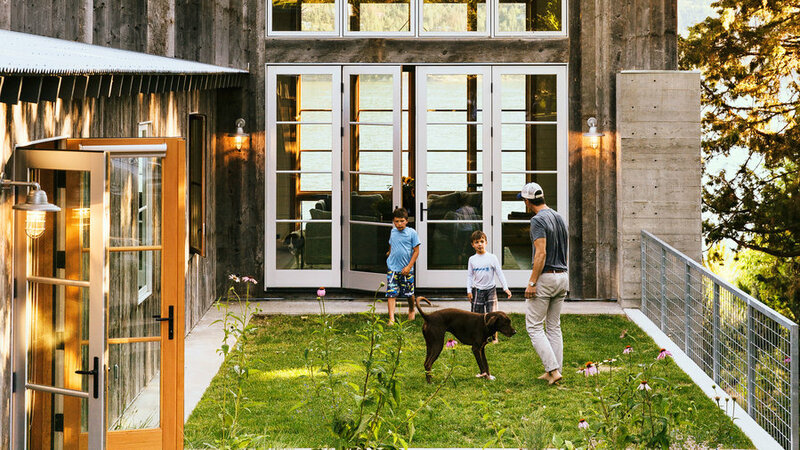 This house on Washington’s Lake Chelan solves the problem by making the driveway side of the home a private area with a lawn and a separate entrance to a guest room. The glass living room doors still allow the homeowners to see the lake the second they drive up." High on a hillside in Portland overlooking snowcapped Mt. Hood, a modern house clad in Northwestern wood stands. 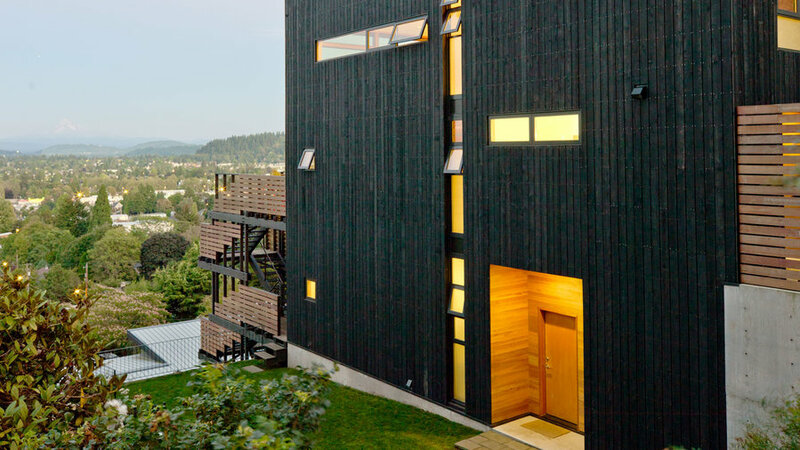 The architect stained the wood matte black to contrast the natural setting and let the creative window placement shine. The ranch house is as quintessentially Californian as Yosemite and artichokes—and it’s proven to be the most versatile architectural icon we have. 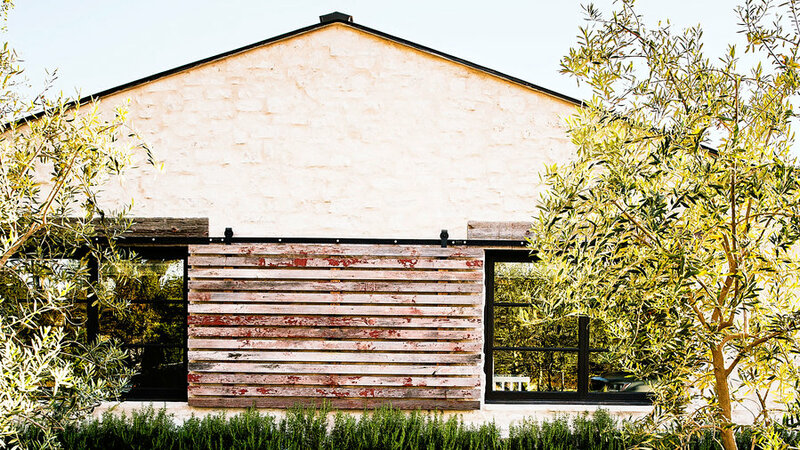 This architect homeowner left the shell of his ranch but chose finishes that give it Old World character, including reclaimed weathered wood and plaster siding. Barn red siding stands out in the often-gray and misty sky on Oregon’s coast. This house is a short walk to the beach so the architect chose a metal roof for more durability against wind, water, and salt. Huge expanses of glass. Exterior walls that roll up and virtually disappear. Almost 2,400 square feet of deck. 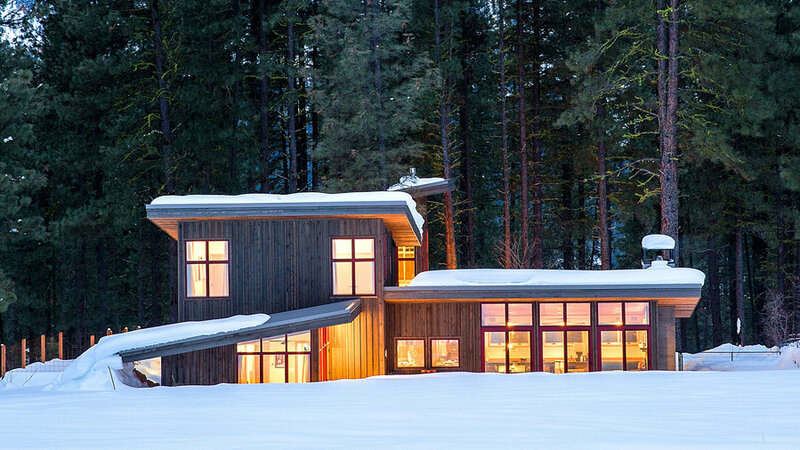 This pre-fab house opens wide to the Montana valley where it sits. 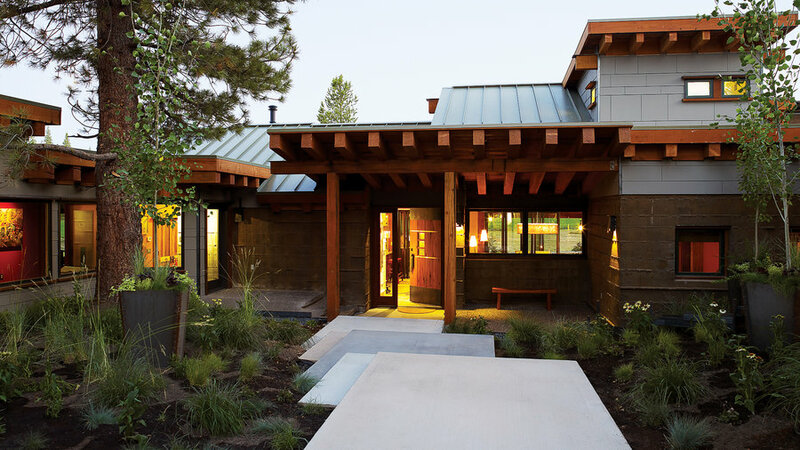 Industrial touches—like the mechanics to lift the wall open to lead to the deck—nod to the land’s hard-working ranching roots. Walls of windows frame Puget Sound and the Olympic Mountains on one side and a dense forest on the other. The wide-open nature of the home is inspired by the homeowner’s South African roots. The cantilevered roof allows for a deck up top as well. 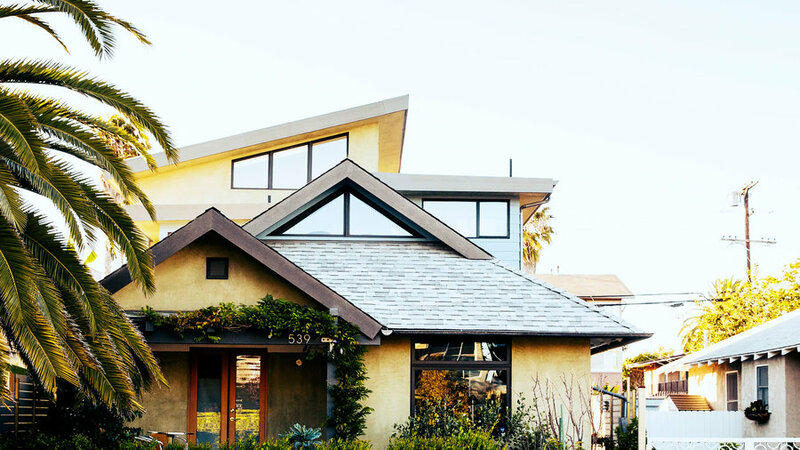 The back of this San Francisco Edwardian received a contemporary addition clad in white cedar shingles for low maintenance. The shingles will eventually fade to a silvery gray. Copper gutters and black trim add contrast. 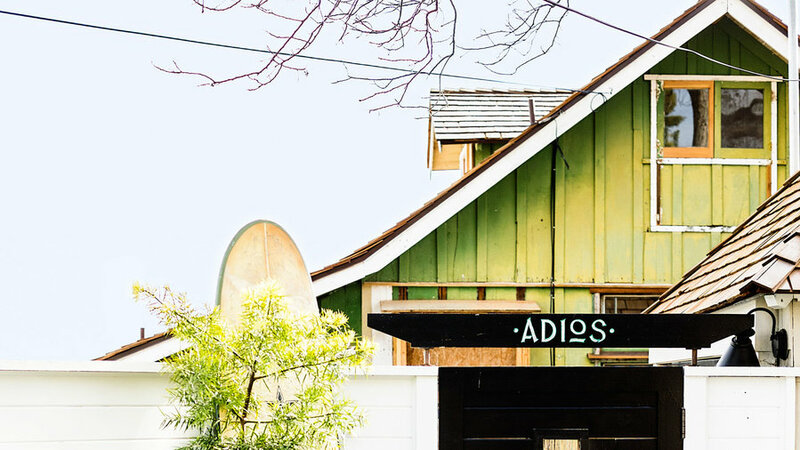 This historical Laguna Beach, California, home got a fresh black and white palette, drought-resistant hardscaping, and cheeky touches like the “Adios” sign by the back door. 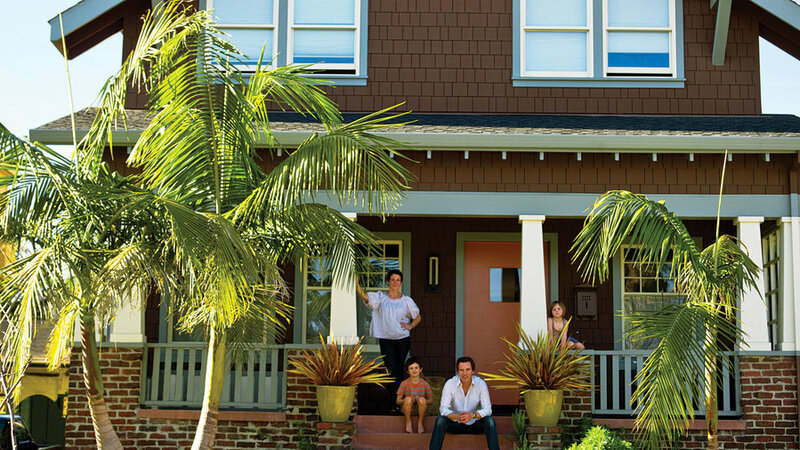 The changes modernized the home without stripping it of character. 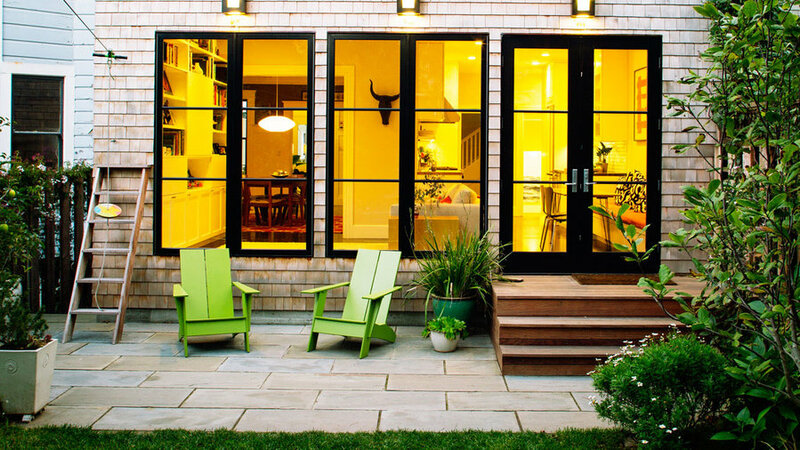 To create the feeling of a wraparound porch, the architects outfitted the enclosed porch with wood windows. All the frames got a coat of yellow-gold paint to update the exterior. 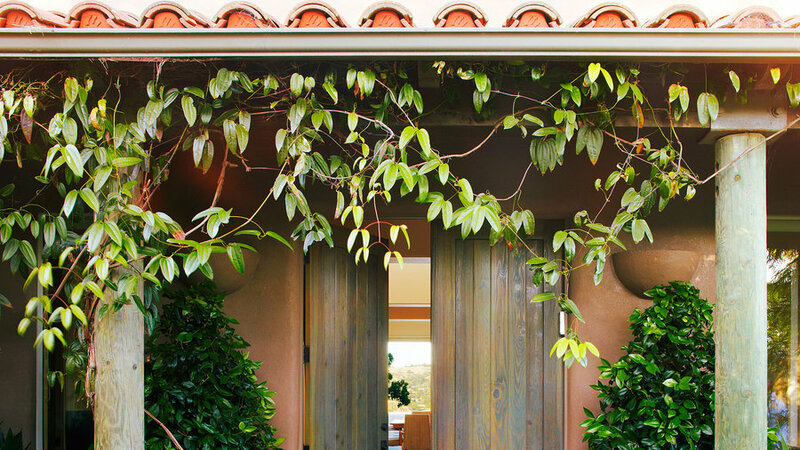 The gracious entry that’s a signature of Mediterranean-style homes begs for greenery for even more romance. Dainty Clematis montana hangs from the tiled roof line here, while pots of rounded boxwood and sculptural Agave attenuata enclose the porch and pyramid-shaped wax-leaf privets flank the front door. 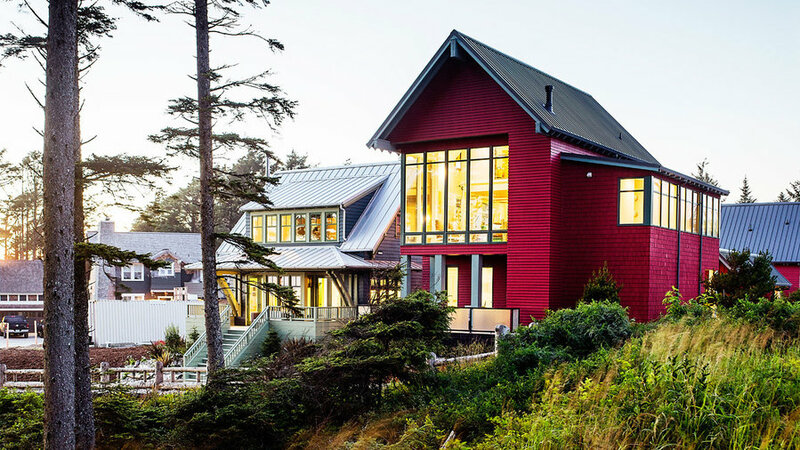 To protect the natural landscape of Washington’s Mystery Bay, the architect vaulted this house on an elaborate structure of tripodlike stilts. A wide open-air porch extends across the entire lakeside of the home. 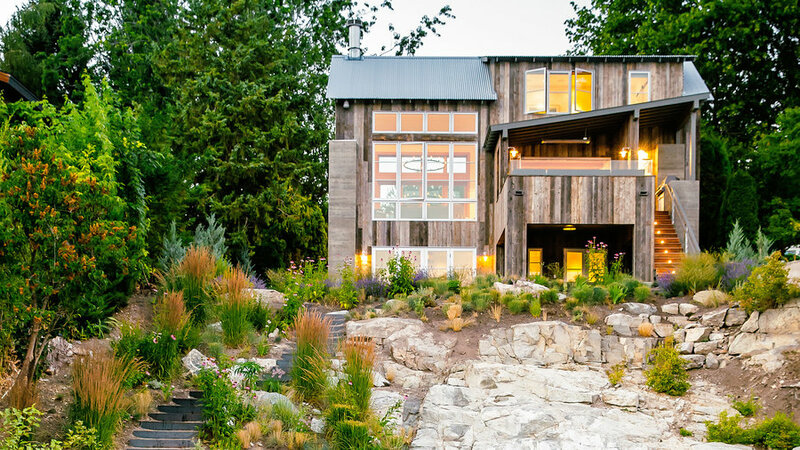 Silvery gray reclaimed wood helps this tall lake house stay unobtrusive. Bonus: It’s basically maintenance-free. Board-formed concrete pillars on the home’s corners accent the barn-like façade. 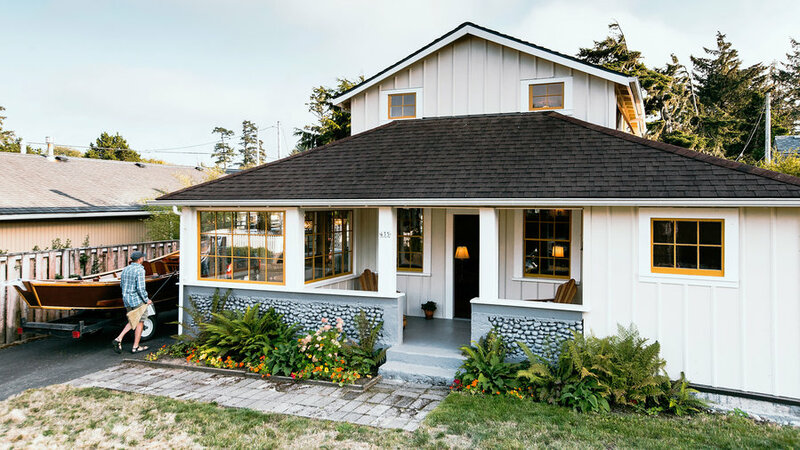 A remodeled bungalow in Oakland, CA, gains a little formality from grand wide steps and the beautifully painted railings and pergola. Matching palms and pots frame the staircase perfectly. 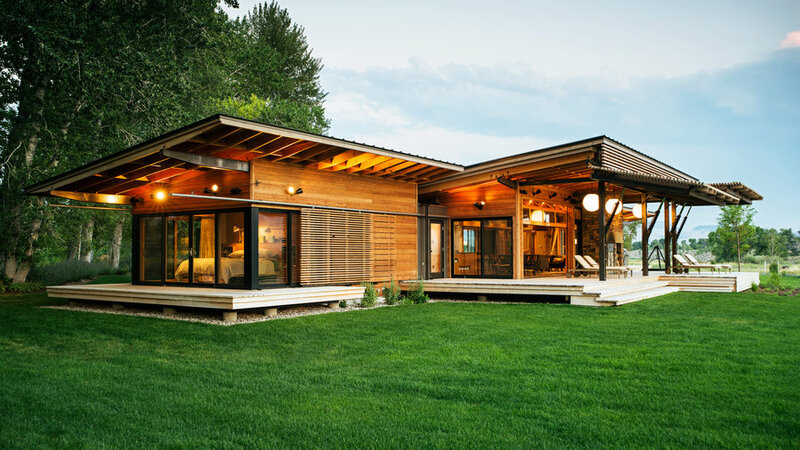 This Washington cabin’s shed-style pitched roof is a contemporary version of a traditional shape. The architect designed a combination of glass doors and fixed-pane windows, providing big views at less cost than expanses of solid glass. Gorgeous views of the Santa Ynez Mountains are provided by this glass-walled Montecito home. The steps pan almost the entire length of the home, making them useful for ad hoc seating in the outdoor living space. 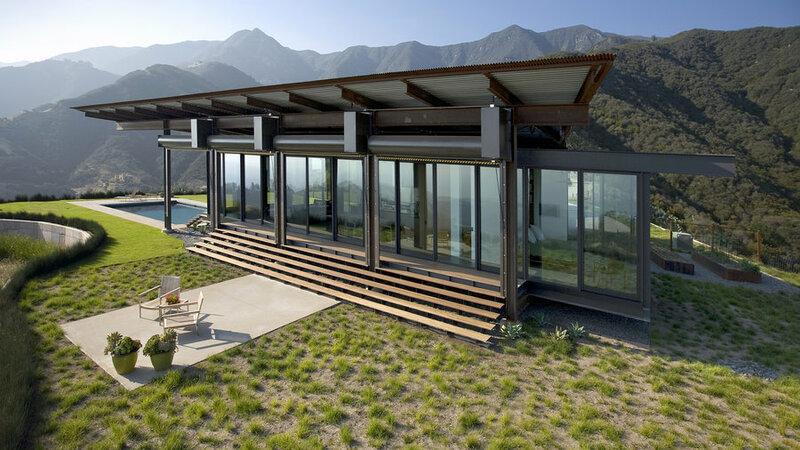 Floating concrete platforms lead to the front door of this mountain home, sheltered beneath a large loggia. The exposed beams nod to the ski lodge style in the area. James Hardie siding balances the rustic touches with a smooth, all-weather finish.